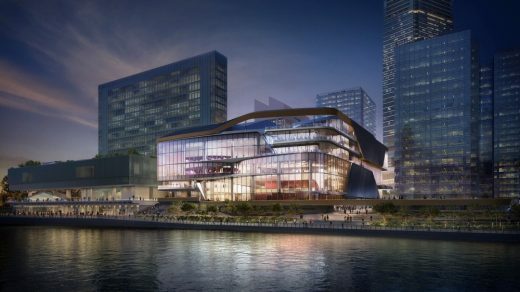 The Lyric Theatre Complex is located in the West Kowloon Cultural District in Hong Kong, an ambitious 40 hectare waterfront cultural quarter which combines open public space with a wide range of cultural venues. Here museums, theatres and concert halls intermingle to create a vibrant district for Hong Kong, where different disciplines within the arts can interact, collaborate, innovate and develop. 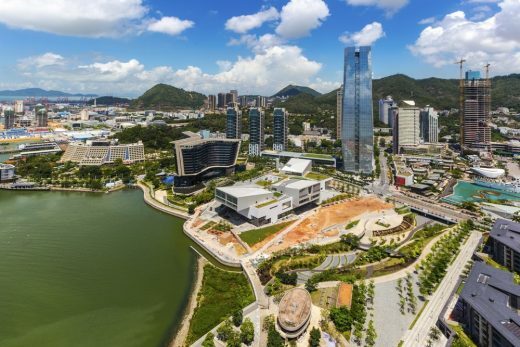 Alongside the wide variety of cultural offerings, the District also comprises a mixed-use residence, office buildings, and 23 hectares of public space and squares, all of which are connected along a two kilometre long harbourfront promenade. The approx. 41,000 m2 Lyric Theatre Complex is a mixed-use project housing three theatres (the Lyric Theatre, the Medium Theatre and the Studio Theatre), a Large Rehearsal Room which can also be used as an additional performing arts venue, a Resident Company Centre with eight dance and rehearsal studios and administrative facilities, and an extensive programme allocation for Retail, Dining and Entertainment. The Lyric Theatre Complex has been overseen by UNStudio Asia. Headed up by responsible Partner Hannes Pfau, UNStudio Asia consists of two full service offices located in Shanghai and Hong Kong. Theatre buildings are no longer the enclosed, dark, clandestine ‘black-box’ volumes they once were. Today theatres are designed to be open, welcoming and inclusive – aiming as they do to attract a broader public and make the performing arts accessible to everyone. 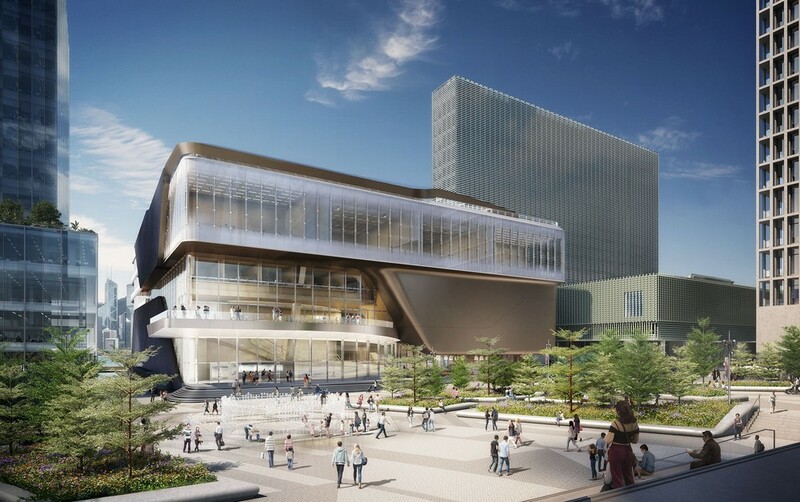 Transparency is therefore an important facet in the design of the new Lyric Theatre Complex; it openly displays what is taking place inside and invites in theatre-goers and general visitors alike. This inclusive approach is further supported by providing additional programme for the public to enjoy that is independent of performance time-tables. Even the Resident Company Centre programme – stacked above the Studio Theatre – enables views into the dance and rehearsal studios from the outside plaza. This transparency further activates the Artist Square to the north of the complex. 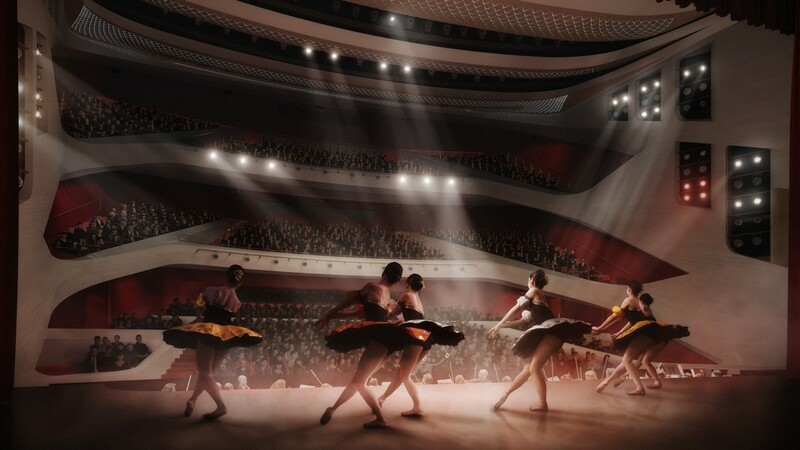 Whilst the three theatres within the Complex draw their own distinct identities from the types of performing arts to which they cater, their designs follow a unified approach essential to both creating a complementary family of theatres and a coherent building. Each theatre therefore has its own distinct colour which relates to its function. This colour is not only applied in the auditoriums, but also in the correlating foyers, thus also acting as a means of wayfinding. 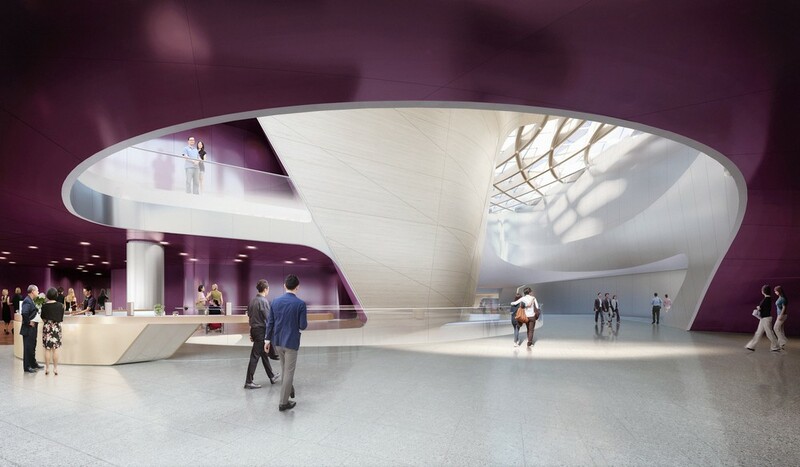 The colour and intensity of the spaces become more vibrant as the visitors get closer to the performing arts venues: the Arrival Hall and ‘Central Spine’ circulation routes employ neutral tones, but the intensity of colour builds and reaches its height when entering the auditorium. As the largest of the three auditoriums, the 1450-seat Lyric Theatre is a principal venue for various forms of dance performance and will also house other preforming arts events including musicals, opera and film premieres. As the most formal of the three theatres, the Lyric Theatre reflects the grandeur and distinction of baroque-era theatres through the use of red and bronze-toned details, while a combination of a cooler grey/brown toned wood adds a contemporary touch. The design of the Lyric Theatre arises from the need to create asymmetrical seating arrangements, offset per floor to maximise the total seating in a spatially constrained building. However, through the angling of the side seat pockets and balcony frontage, there is the impression of symmetry from the stage, to the benefit of the dancers. 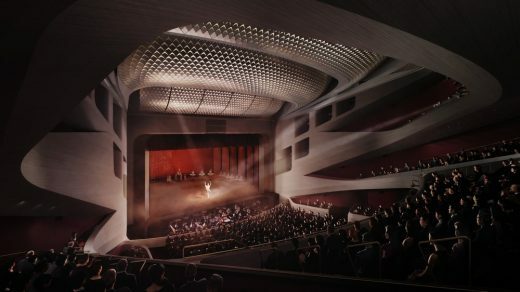 Additionally, the size of the first balcony circle level is maximised where the best seats are located for watching dance performances, while smaller pockets on each level provide greater intimacy in this large venue. 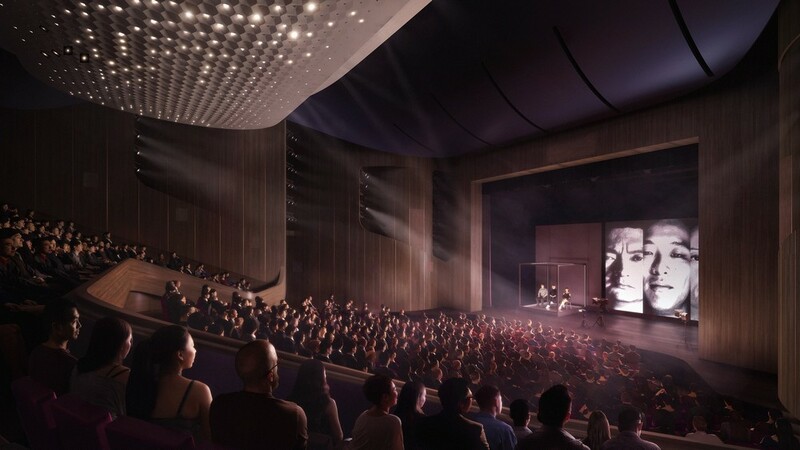 The 600 seat Medium Theatre is dedicated to theatre and dance. This theatre uses a dark saturated purple, which is contrasted with a walnut interior with metal inlays. In order to create a more intimate, unified audience, instead of a stacked approach, the upper and lower stall levels of the auditorium are visually united, separated only by a single geometric gesture that makes the upper stall ‘float’. The 270-seat Studio Theatre is for small-to-medium scale text-based drama productions. A homogenous dark blue-coloured interior creates a black-box-like atmosphere. 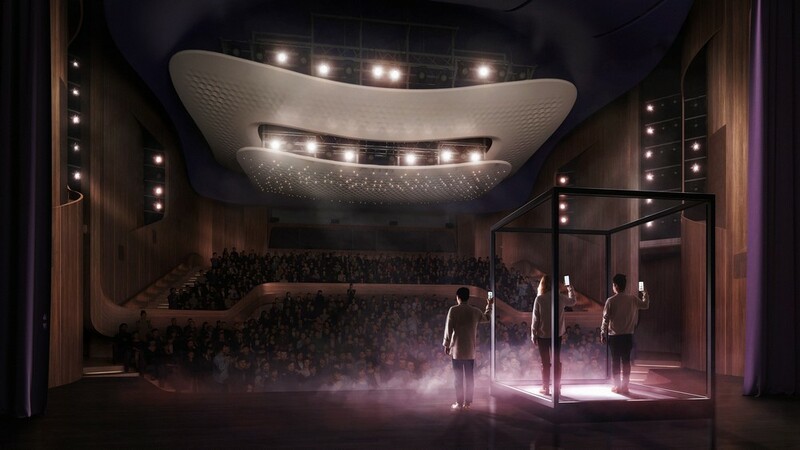 To truly enhance the intimate scale of the theatre, the auditorium is encased in a single shell that also encompasses the front of the stage and encloses the performers and audience within one space. The building circulation is driven by a ‘Central Spine’. This spine acts as an inner alleyway, creating a direct connection between Artist Square to the north and the harbourfront to the south. 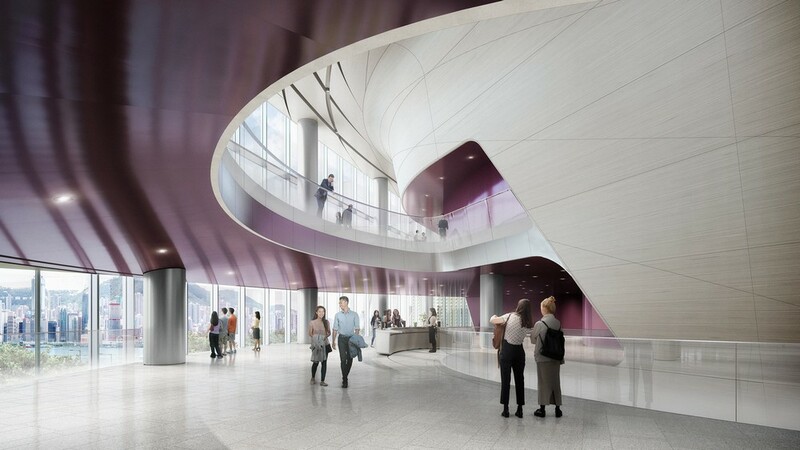 In addition, it provides the main circulation from the entrances on both sides of the building to the three theatres, whilst also creating an aperture effect that slowly reveals a view of the harbour as visitors walk southwards through the spine. To provide an efficient circulation that can not only access the different heights of the theatres, but also weaves between and around the theatre volumes, the Central Spine forms two curving, stacked ramps (the lower spine and the upper spine), which together form a three-dimensional figure 8. The lower spine leads visitors down to the Lyric Theatre, while the upper spine leads visitors up to the Studio and Medium Theatres. The upper spine opens up to two voids with skylights, located in the loops of the figure 8. These voids allow visual connections between all visitors walking through the theatre programme and both the Resident Company Centre and Retail, Dining, and Entertainment. They also provide natural light to the interior and direct visibility from the rooftop public terrace to the spine and foyers below. 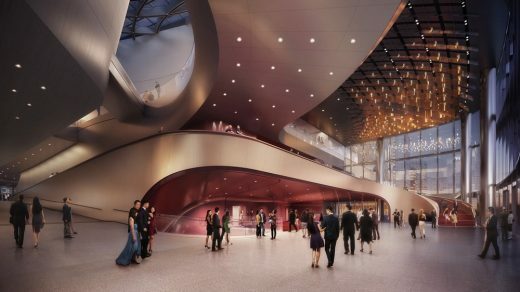 To enable all three theatres to be operational at the same time, each of them was equipped with its own foyer that also grants direct access to outdoor terraces overlooking either the Artist Square, or the harbourfront. 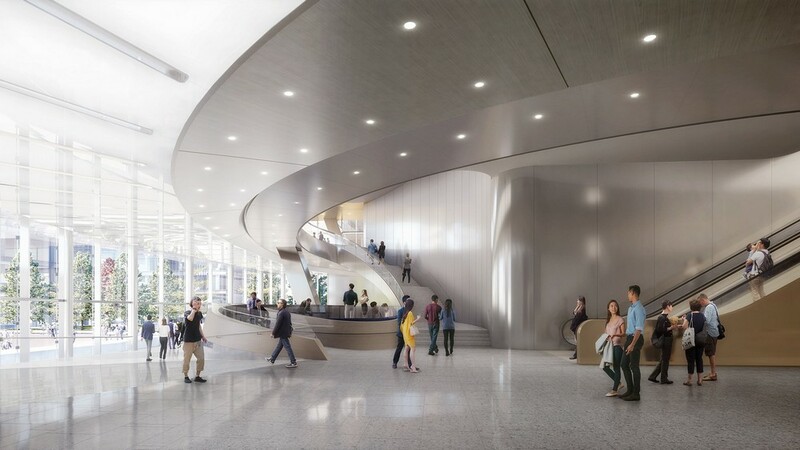 These foyers and the Central Spine together act as a fourth performing arts venue, creating a ‘see and be seen’ relationship between the public spine and the semi-public foyers. Each of the foyers merges into the Central Spine on multiple layers, creating balcony overlooks where this viewer/viewee relationship is accentuated. In the masterplan for the Cultural District, designed by Foster + Partners, the street level of the entire district was designated as pedestrian access only, whereas all vehicular traffic is located below ground. In addition, the Airport Express Line (AEL) tunnel and the vehicular carriageway and loading area both run directly below the Lyric Theatre Complex site. 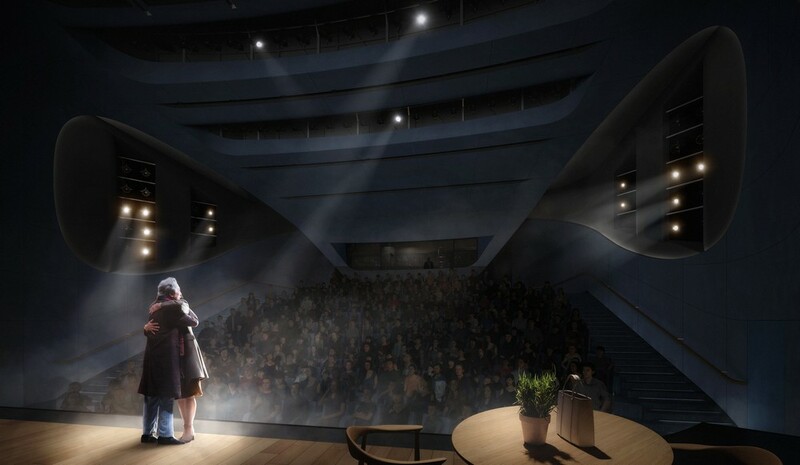 This results in complex organisational, acoustic and vibration conditions for the new theatre complex. The greatest challenge in the design of the complex was therefore to place the three main theatres in the constrained volume of the site boundary (with below ground loading bays), in such an arrangement that all of the theaters would be acoustically isolated from the infrastructural site conditions below and the programme within, while still providing the necessary public circulation routes needed to reach the different levels of access to all three theatres. As a result, the large Lyric Theatre is placed eleven metres below ground level, enabling alignment with the underground loading bay. Space constraints necessitated that the Studio Theatre and Medium Theatre then be placed above ground level so as not to collide with the Lyric Theatre. These two theatres are therefore raised and staggered within the building massing and are separated to guarantee sound and acoustic isolation. The solution found to shield the building and all the theatres and performing arts venues within from the vibration and noise of the site was to ‘float’ the entire building on over 650 isolation springs. This enables the Lyric Theatre Complex to be separated from any basement and ground level noise and vibration caused by the AEL tunnel, vehicular traffic, or adjacent underground utilities. Additionally, because of the amount of theatres and programme types housed in the building, a hybrid box-in-box double shell system was used to isolate each of the theatres, while floating slabs were inserted between theatres and adjacent secondary programme. 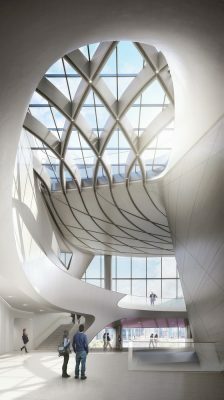 The Resident Company Centre – which is comprised of administrative offices and eight dance and rehearsal studios for different resident and visiting companies – is separated from the theatre programme, but has visual connectivity with the central spine below through a glass void. The Resident Company Centre also has its own private rooftop courtyard. The Retail, Dining and Entertainment programme is separated into three independent pockets within the building and includes light refreshment dining, restaurants, bars and high-end destination dining. These pockets can all be accessed directly from outside entry points, as well as from the Central Spine of the building.